PIERS, Part 4: Directories & Databases & Research Reports, Oh My! 10/06/2012	by Robert Lindsay Thompson Comments Off on PIERS, Part 4: Directories & Databases & Research Reports, Oh My! In the previous several articles, we outlined several of PIERS’ competitive advantages, then looked at their three evolved and related products: Piers TI, IPiers and MyPiers (which share a common UI and database) and subsequently summarized their newly acquired Trade Intelligence applications: Stats Plus, Prospects and Trade Finance. In addition to these interactive platforms PIERS also offers other International trade related products. International Trade Databases. PIERS maintains transactional level databases (similar to U.S. Customs data) on 17 countries (all but two are Latin American). Notwithstanding, these databases come complete with HS Codes, shipper names and commodity (product) details and encompass waterborne, land and air transport. We reviewed the Mexican database. Despite being in Spanish, it was a treasure store of information. Specific 6 digit harmonized codes were assigned to each shipment as well as the value, information and method of transport (which included air, truck and rail) for both imports and exports. Therefore, with a little work and linking it to other databases, you could put together a pretty good profile of U.S. – Mexico cross border trade. 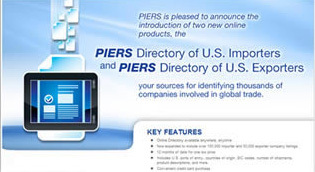 PIERS Online Directories of U.S. Importers & U.S. Exporters. Basically, it’s a summary version of recent (last 12 months) trade activity by importers and exporters. Previously available via hard copy publication or on CD, it is now accessible online (either separately or combined). It includes over 150,000 importer and 50,000 exporter company listings. These directories summarize top 3 to 5 U.S. ports of entry, countries of origin, SIC codes, number and value of shipments, and product descriptions for each trader. PIERS Maritime Research. PIERS also publishes, in association with its sister company the JOC (Journal of Commerce), specific reports on Shipping, Carriers, Ports, and Trade Flows. The scope of our survey necessarily excludes review of sister UBM Global Trade Companies and their products. However, it may be said that in the area of integration – connecting the dots of disparate international databases – there is still significant ground to cover and opportunities to exploit. Wiki reference. Whereas PIERS has suffered in times past in the area of strategic forward thinking management, the acquisition of Commonwealth Business Media (including PIERS) by UBM in 2006 (UBM Global Trade formed in 2008) and installation of key executives John Day (CEO), Peter Spinelli (CFO) and Gavin Carter (CIO) have dramatically changed the mix. Complete overall of their legacy IT systems along with acquisition and launch of innovative CenTradeX TI applications (as well as core technology staff) have also aided in PIERS’ competitive advancement. Ironically, the one aspect they had shown greatest need for improvement is in marketing. However, recently they have joined the ranks of other market savvy TI providers in making intelligent use of social media. They have a compelling story to tell , the resources to tell it well and the management to sell it. In that spirit, below find a downloadable list of product brochures and data samples, courtesy of the excellent sales team at PIERS headed by Wael Jarous. For more information, please feel free to contact sales manager Aliet Martinez at amartinez@piers.com. **By the way the featured image appearing in this post is from a mural hanging in UBM headquarters, created by Meagan Spendlove.